Sichuan cuisine is all about that bold, loud flavor and mala sensations from Sichuan peppercorns. You'll also find the contrast of bright, crisp pickles to break up the intensity of the meal. 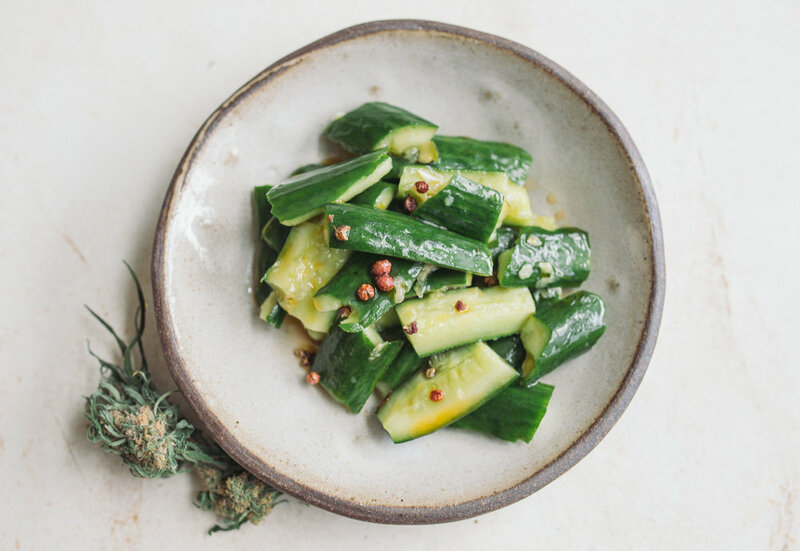 This quick cucumber side is incredibly entertaining to put together, I find that smashing and tearing into cucumbers is great for stress relief! 1. Cut cucumbers in half lengthwise and place face down on cutting board. Take a chef's knife and smash the cucumbers until they're flattened. Using your hands, rip the cucumbers into bite-sized pieces. Discard any seeds that fall out. 2. In a mixing bowl, sprinkle Kosher salt over smashed cucumber pieces and let rest for 5-10 minutes to draw out excess moisture. 3. In a small mixing bowl, lightly mix together sesame oil, medicated chili oil, and sugar. 4. Drain the cucumbers and lightly rinse to get rid of excess salt. Add garlic and Sichuan peppercorns. Pour the sauce over and toss well. Salt to taste and serve cold. This will keep in the fridge for up to 1 day.